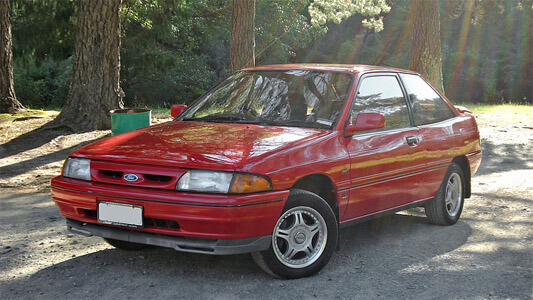 The KF and KH series Ford Laser was a vehicle re-badged and slightly redesigned from the Mazda 323 Protege, as such the provided manual is for the Mazda 323 of the same time. All critical specifications remain the same and almost all components are shared between the two, apart from some cosmetic body and interior modifications. Topics in this workshop manual include: General Information, Scheduled Maintenance, Engine SOHC, Engine DOHC, Lubrication Systems, Cooling System, Fuel and Emission Control System, Engine Electrical System, Clutch, Manual Transaxle F5M-R, Manual Transaxle G5M-R, Front and Rear Axles, Steering System, Braking System, Wheels and Tyres, Suspension, Body, Body Electrical System, Heater and Air Conditioning, Technical Data, Special Tools, Parts Index and Wiring Diagrams.